They have a single comb with five point, red wattles, and matching earlobes. The most widely recognized variations include: Barred, Black, Blue, Buff, Cuckoo, Columbia, Gray, Golden Neck, Mille Fleur, Lemon Mille Fleur, Silver Mille Fleur Mottled, Partridge, Lavender, Porcelain, Blue, and White. They have a compact body with long wings that follow the angle and contour of the feathered vulture hocks. 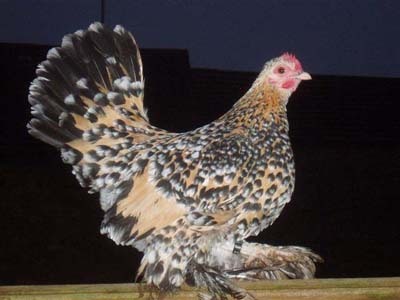 An upright stance with a full and matching upright tail gives the Booted Bantam a very jaunty appearance. They look good, and often look like they know it. Booted Bantams needs only a few square yards of run and a comfortable dry coop. They have tropical origins and will need indoor treatment and heat during cold months. During the summer, Booted Bantams like to luxuriate in a dust bath. Move the coop and run monthly to curb the spread of parasites in the soil. Most pet stores now carry quality Bantam feed. Make sure they have clean water at all times. Show Bantams will require more attention than the Booted Bantam pet. Serious exhibitors keep show fowl confined on soft bedding to protect the long, hock feathers from damage.